I keep working on this quilt and it seems to be taking longer and all the time. I know that no one out there knocks a queen size quilt out in a few weeks but I forgot just how long it takes. 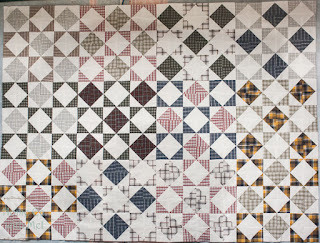 I still love the look of lots of little pieces, in our case half square triangle blocks, to make up a quilt but I certainly will keep the time requirements in my head going forward. It's part of being a designer. You get this great idea in your head and you know it's going to be awesome but when you are coming up with it, the time restraints don't always figure into the plan. That's the case with this quilt. My brain wasn't thinking about how long things take but that's OK, I'm not truly on any sort of deadline though I'd like to start something new with you all. Enough of all of that let's move on to getting the next part of the quilt put together. So we have all those blocks we made in the last step. We need to sew them together. I did 3 across the top and 4 down. I also alternated white and colored blocks. I based it on what the first section of each block. In my picture it is sideways because my design board is big enough to go the other way but part of it goes below a table and I can't photograph it that way. My first border is just plain strips from a shirt I found after I had made all the half square triangles. I just cut 2 1/2 inch strips and sewed them into strips. I didn't match my plaid. It's totally up to you if you want to go through that work or not. I figure by the time it's quilted no one will see it. My husband would have to match the plaid up. The plaid for the border is purple and green. 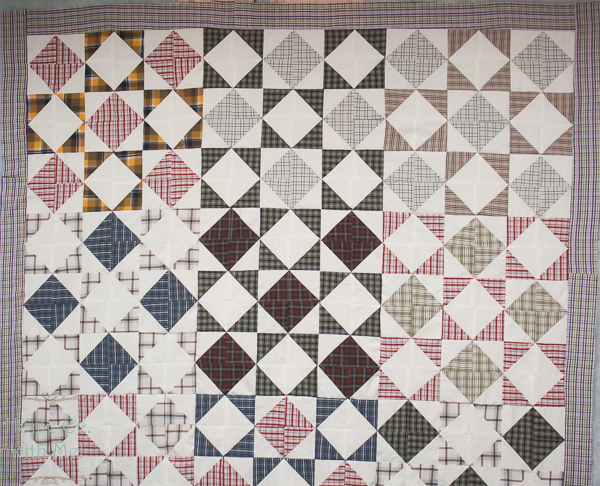 I think it's a feminine plaid when paired up with the rest of the quilt. I thought the quilt needed something a little girly but not overly girly. 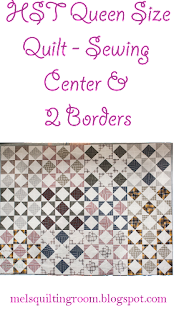 Quilts tend to lean towards the feminine side and I didn't want this one to do that. I'm not overly girly anyway but do like a few girly touches. It's why I have long nails, it takes place of wearing no make up. So our next boarder took me a little work. I ended up splitting some of the blocks I already had made. Yeah, I know should have planned better. 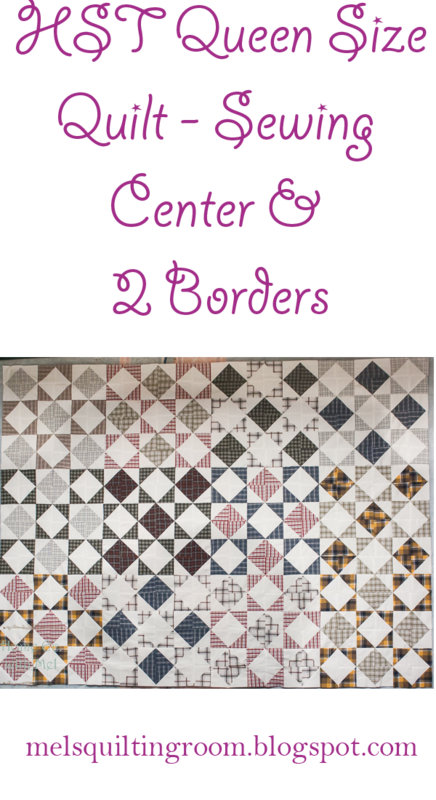 You'll need 20 pairs for the top border and 20 pairs for the bottom border. Half of each set need the white on the outside and half need the color on the outside. I started with white on the outside and alternated between those and the color on the outside ones. 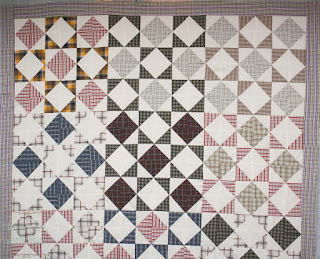 I like the big arrows that it makes and it makes it different from the main portion of the quilt. 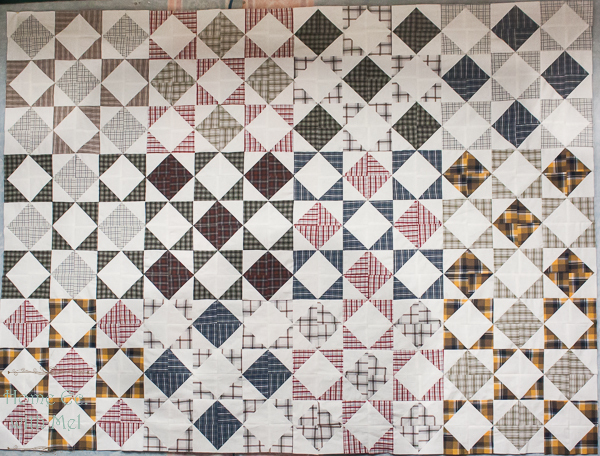 Next time we'll do the side borders and finish out the quilt. Then it will be time to move onto a new smaller project. Christmas is still coming and I don't know about you but I have lots of people to sew for this year.